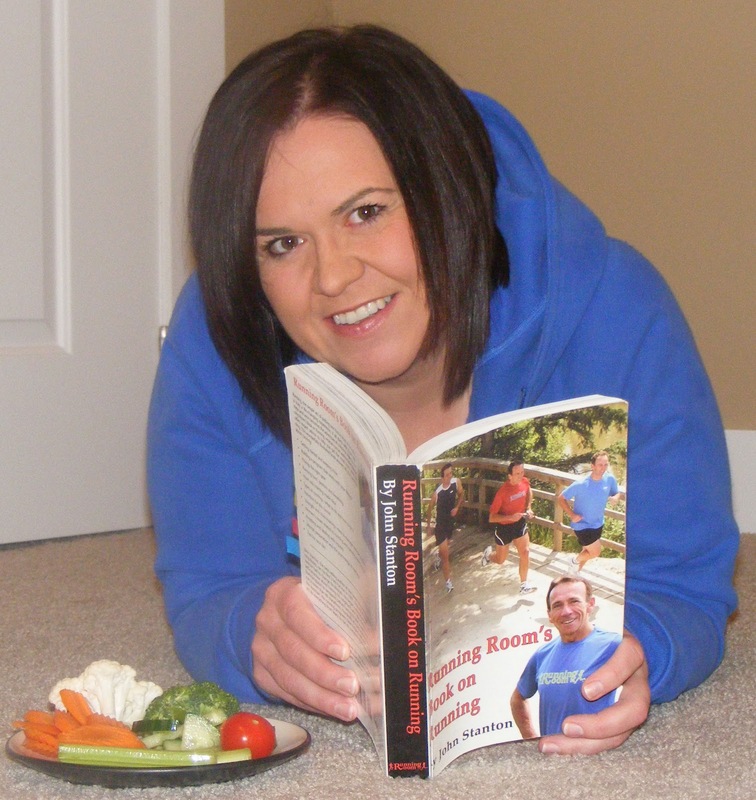 Michelle Kempton - Run, Runner, Running: Injured, plump and OLD! For anyone that isn't familiar with our upcoming race: "The Turtle and The Hare" here is a quick rundown to get you up to speed. Basically, I'm a novice runner (to date I've only run in 3 local non-competitive races of 5K and 10K). A couple months ago while I was trash-talking my co-worker at the Running Room, I challenged Jonathan Kirk (a seasoned tri-athlete and world traveled runner) to a 5K race! For the record, when I first suggested that "I could take Jonathan down!" I had no idea that he was an elite athlete. But for some strange reason, knowing this doesn't deter me in the least, actually if anything it makes me want to win the race even more! Since the original challenge was made, Jonathan has injured his knee and I've gained some weight. Even though Jonathan is injured and I'm plump, don't worry the race is still on no matter what (even if Jonathan is limping and I'm waddling)! I'm pretty sure Jonathan is thoroughly enjoying the weekly torture of active release therapy on his gimp knee and still hopes to run before our race (though Jonathan is still claiming that he won't train for our 5K challenge (as if... he totally will... he just won't tell anyone). Jonathan's doctor has said that he's at least a month away from running (which lets be honest is good for me). 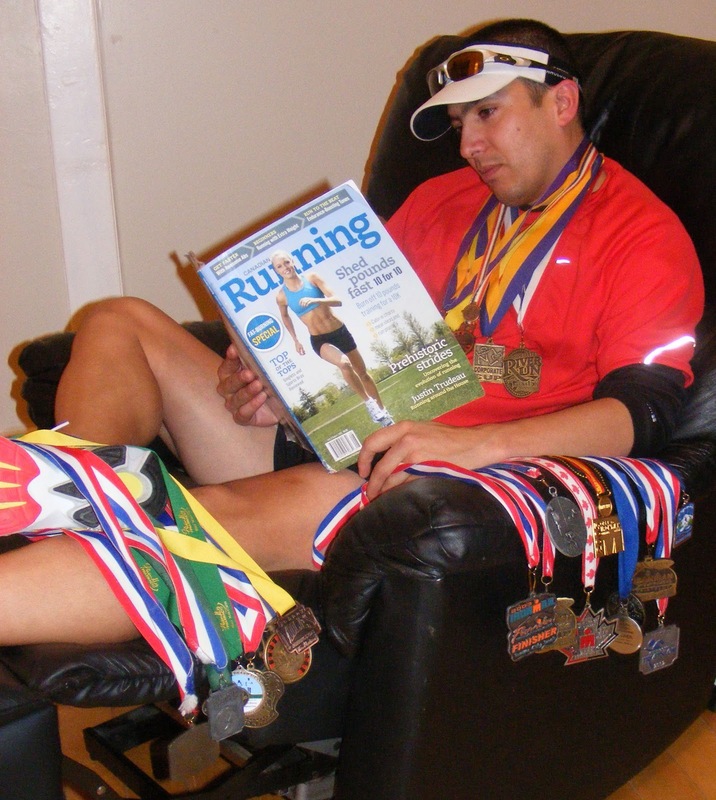 Jonathan currently has no choice but to sit at home chillin' like a villain, icing his knees twice a day, reading magazines, watching movies, eating Doritos and shining his running trophies and medals. Though the last activity is optional, I'm pretty sure it's Jonathan's way of mentally preparing himself for his demise when I win our race. I give Jonathan credit, from the number of running medals in his possession, it's obvious that he's won races in the past... he just won't win a trophy for our race on May 1, 2010 (well unless there is a medal for the loser of course)! I'll be honest... over the last two months I've been pretty slack in my training... so it's time for me to step it up my game. There is no question my current speed will not beat Jonathan, so it's imperative for me to knock some serious time off my 5K. A very wise runner once told me (oh wait retract that last part... it was Jonathan) that weight is a factor in speed running... so my first step to increasing my speed will be to lose 15 pounds. Guess I'll be replacing my favorite afternoon snack of a Kit Kat bar with fresh veggies (without dip)! Along with getting my food in check... Bruce (the Store Manager of the Halifax Running Room) has been giving me invaluable tips and helped me plan a strategy to get my 5K run-time from 28 minutes to 23 minutes. In November, I managed to get my 5K race time down to 25 1/2 minutes (that was a personal best)... but each time I've run at that speed I've almost thrown up. I can only imagine what 23 minutes will feel like... but if I beat Jonathan it will all be worth it... no matter what! Unfortunately, since I've gained some weight over the last 2 months, my time has creeped back up to 27-28 minutes! It's so frustrating! Both Jonathan and I have turned a year older since we first decided to race each other. As two runners in their mid 30s, you'd think we would have the wisdom and maturity to not participate in a childish race, but maybe that's the secret to staying young at heart? Actually, I think it just proves neither of us have a life! The race is scheduled for Saturday, May 1, 2010 at 10am (mark it in your calendar)! Everyone is welcome to come and watch us race. We will run 6 laps around the Eastern Passage Boardwalk (located at MacCormack Beach on Shore Road in Eastern Passage). Signs, noisemakers and cheering on your favorite runner is highly encouraged! This is without a doubt "THE ATHLETIC EVENT OF THE YEAR" so don't miss it! Some may say it's almost more important than the Olympics... well for our friends and families anyway... ahhh ok maybe just mine... ok maybe just for me! We are still trying to decide what type of handicap would be fair so then our race isn't a complete blow out (remember Jonathan currently runs 5K about 10 minutes faster than me). We encourage everyone to email us with words of wisdom, encouragement, suggestions for the race handicap or training ideas.